Uglyworld #656 - Shipwrecked, originally uploaded by www.bazpics.com. Turtle had been seaching through Flickr's explore map function to find cool things to visit while we were out on the Pacific Coastline for out "Cannon Beach Daytrip", and he got extremely excited when he found photos from people of the remains of the ship called Peter Iredale. 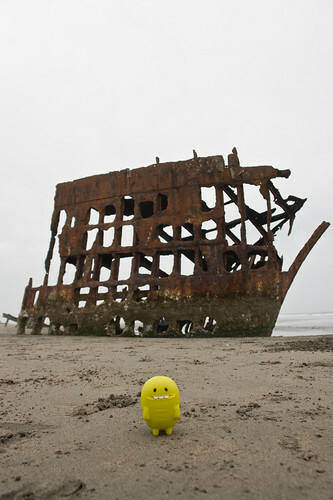 Here you can see him (with his excited grin on his face) standing on the beach in front of the carcass of this very ship.